No, that’s not one of my usual punny titles… I really have been blogging for ten years. According to my archives, I wrote my first post ever on June 2nd, 2006. Back in those days, cell phones didn’t have cameras, social media was virtually non-existent, and most people had no idea what the heck a blog was but assumed it was something rather unpleasant. As for me, I was a twenty-something corporate flunkie with a one-bedroom apartment near Christie Pits, a flat(ish) belly, a scrappy little tabby cat, and cute boyfriend I’d started dating a year earlier. Some things haven’t changed all that much. The scrappy little tabby cat is still with me, albeit a little greyer and scruffier than she used to be, and the cute boyfriend is still around too, though these days he’s my husband of almost three years. The one-bedroom apartment and the flat(ish) belly, those disappeared by the time I got to my 30s, but I’m actually pretty okay with that. Instead, I’ve managed to acquired myself a house, a fancy camera, a career, a second cat, a whole lotta kitchen gadgets, about 15 extra pounds, a few awesome friends, and a rather substantial collection of recipes…. not necessarily in that order. Considering ten years is practically an eternity by internet standards, it only seemed appropriate to throw together a little something together to celebrate such a momentous occasion. But what to make? 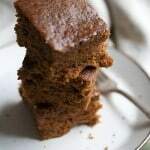 As it turns out, this was a perfect excuse to dust off the very first recipe I posted, a chai-scented banana loaf that I’d baked to celebrate my now-husband’s birthday. To put a properly celebratory spin on that recipe, I turned it into a layer cake. I made the batter as I always do, but baked it up in two round cake pans, and then stacked the layers together with a brown sugar buttercream spiked with a little bourbon. Because, let’s face it, what isn’t made better by bourbon? 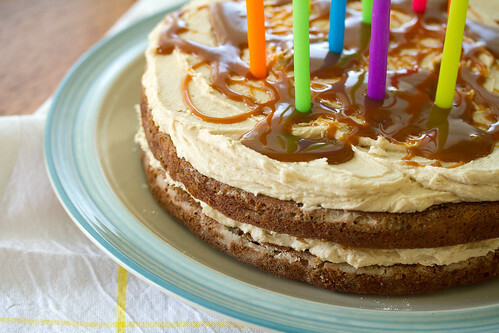 In a way, it’s just about the most perfect cake I could think of to celebrate this blog. It’s a little lopsided and not particularly professional-looking, but think it’s pretty charming nonetheless. And just like most of my recipes, it’s made from scratch using proper real ingredients, and it tastes completely delicious. Not to mention that you can slap it together on a Tuesday night when you get home from work, which I know for sure because that’s exactly what I did this week. Happy birthday, little blog. Here’s to many, many more. PS: To celebrate ten years, I’m also starting up a monthly newsletter. Wanna get in on the fun? Sign up now! Subscribe to Crumb’s free monthly newsletter! 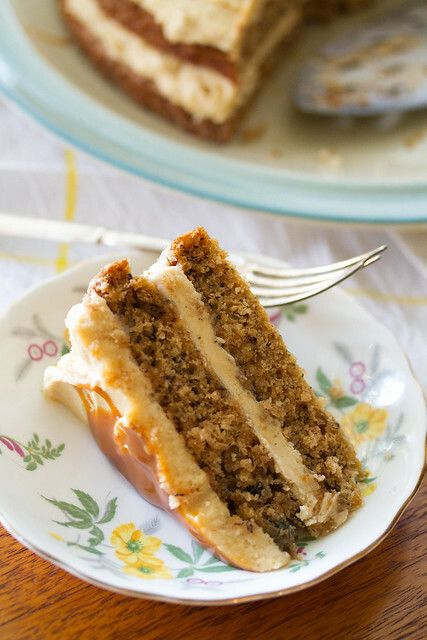 Layers of chai-scented banana cake are stacked with a sweet brown sugar buttercream and a drizzle of dulce de leche for an easy (yet impressive) celebratory dessert. Preheat oven to 350F. Lightly butter and flour two 8” round cake pans.. In a medium bowl, cream together the sugars and butter until fluffy. Beat in the eggs, one at a time, until the mixture is smooth, then stir in the, tea and mashed bananas. If your bananas are mostly yellow, add a tablespoon of honey to the batter at this point to compensate. Mix in the flour, baking soda, salt and baking powder until just combined. Pour the batter into the prepared cake tins, doing your best to distribute the batter evenly between the two. 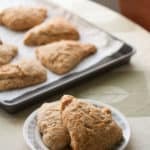 Bake in preheated oven for about 30-35 minutes, or until the tops are firm to the touch and golden brown. Let cool in the pan for about 10 minutes, then carefully invert onto a wire rack to finish cooling completely. While the cake is cooling, use a stand mixer fitted with a whisk attachment to combine the sugar and butter on low speed. Add the brown sugar, cinnamon and salt. Continue mixing on low until well combined, then increase speed to medium and beat for another 3 minutes. Add the cream and bourbon, continue beating for a minute or two longer, or until the frosting is fluffy and spreadable. Place 1 layer on a cake plate and spread half of the frosting on top. Top with a second layer of cake, then spread the remaining frosting over the top. 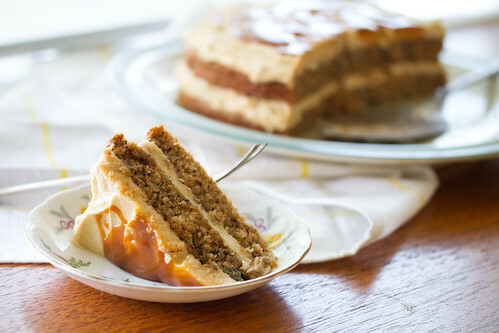 Drizzle the top with dulce de leche. Chill for at least one hour before serving. P.S. This is Julie, Laurence’s cousin. Congrats! 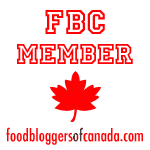 So glad to have met you via food blogging! Hope we cross paths in person one of these days! Here’s to many more delicious years! 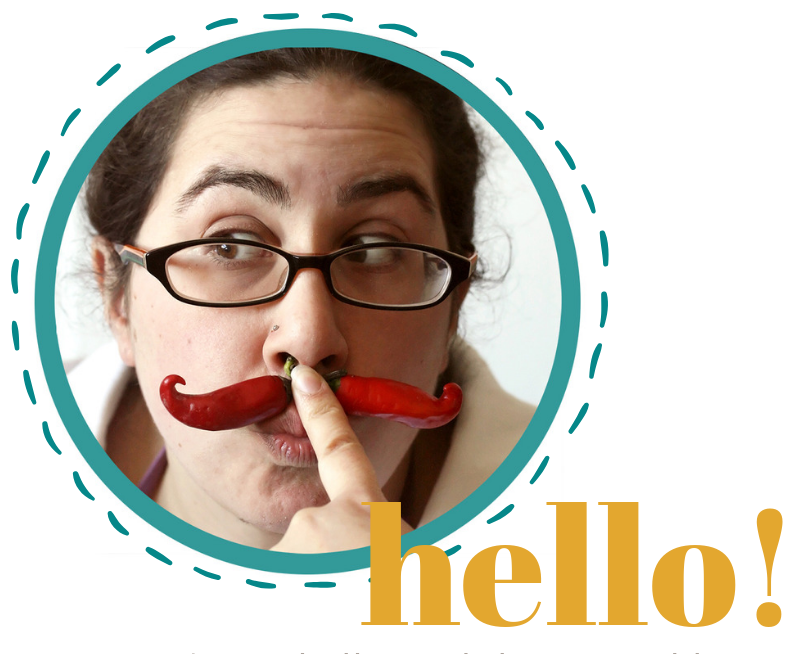 Happy 10th blogiversary, Izz! 10 years is eons long in internet years. You should be so proud of yourself for everything you’ve accomplished, not only in blogging but in your fabulous life. One of the best things that came out of my blogging is meeting people like you. 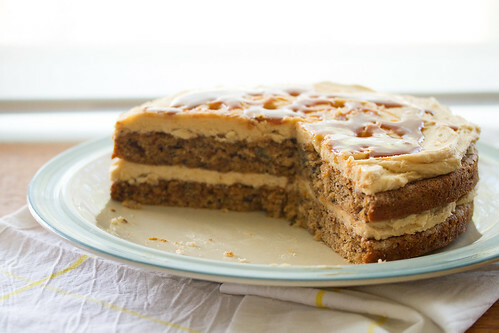 I concur – everything is better with bourbon (like how bourbon is better by adding more bourbon) and I think this cake looks pretty damn amazing. Here’s to many many more years, dear friend! Happy 10th! 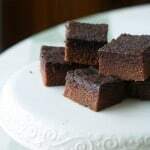 I love that you dug through your archives to revisit the 1st recipe. I don’t know that I could do that with my 1st recipes – they were odd when I didn’t quite know how to bake or how to invent/reinvent a recipe. Hah! 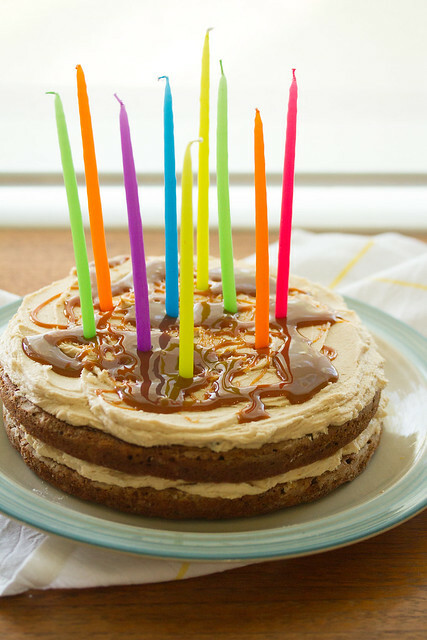 Happy Happy Blog Birthday! You’re like a pioneer!!! !